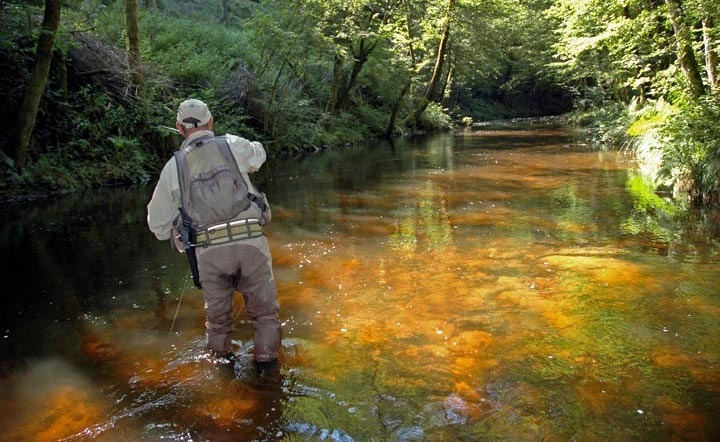 Some areas don’t readily spring to mind as ideal trout destinations, and for me, the Dordogne region of south central France has always been one of those places. I’d always thought of it a wonderful destination for family holidays but for catching Trout? - I don’t think so. 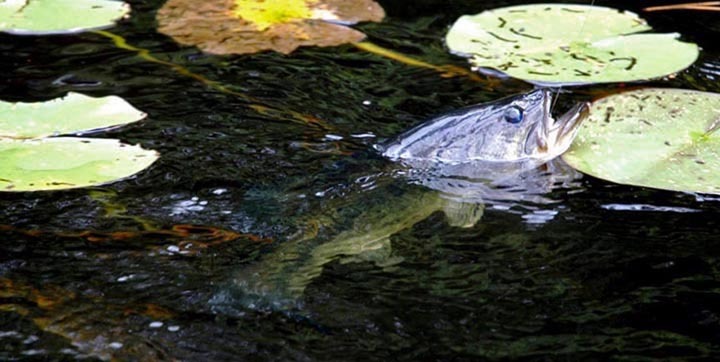 Yet when I finally accepted a long standing invitation to visit a friend, Jean-Pierre Codoux, who’s a guide in the region, I found out just how wrong I’d been about the fishing! The trout rivers of the upper Dordogne valley are varied and plentiful and situated in one of the most scenically glorious areas of France. The Dordogne itself is the major river fed by many notable tributaries, the Doustre and Maronne among the best. These granite based, tumbling mountain streams meandering the forests are somewhat acid, have a wonderful peaty quality and are extremely clear, holding very good densities of small feisty trout. Larger streams like the Maronne are richer, producing bigger trout and in certain sections, good heads of Grayling, too. 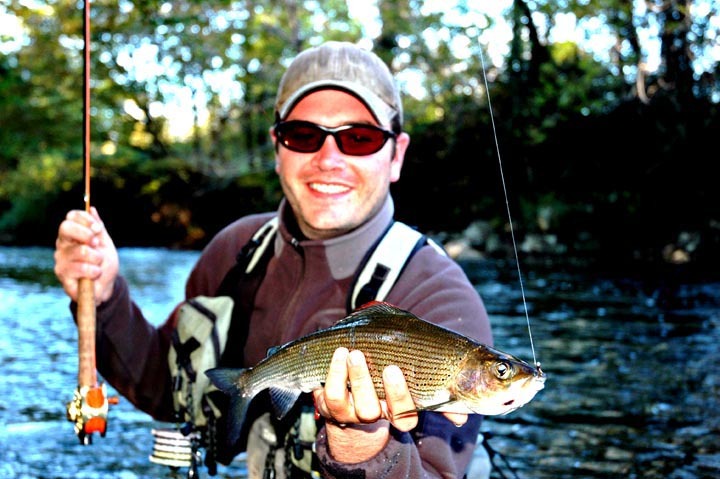 But for those in the know, the upper Dordogne between the beautiful riverside towns of Argentat and Beauliue presents a Mecca for trophy sized trout and grayling, particularly on the no-kill stretches. I arrived in Argentat to find the Dordogne river akin to a raging torrent! Over dinner that night, Jean-Pierre informed me that the hydro-electric plants upstream had opened their barrages to release enormous amounts of water accumulated in a month of unseasonably heavy rain. But not to panic as not all the rivers are affected by the barrages. So the next morning we were off running on my first Dordogne adventure. First stop, the Doustre (thankfully, one of the un-affected streams) and full of small boulder pockets and flats and riffles crammed side by side into a 1.5 kilometer no-kill stretch. It’s a magical stream in a magical setting, dancing through lush wooded countryside and gracing the frontage of many impossibly beautiful riverside manoirs. Jean-Pierre’s favoured method for the pockets and riffles were nymph droppers (tied New Zealand style) to a bushy dry and size 16 cul de canard emergers for the flats. We passed a very productive morning; the peaty waters glowing golden in the morning sun, harmonious with the colours of the gorgeous, eight or so small mountain trout we managed to bring to hand. It was fascinating experience watching J.P’s pocket water technique. Ten foot, four weight rod held high in Czech nymph style, leading the fly down stream with barely a foot of fly line outside the ring tip and only a whisper of fine leader on the water; so no drag on the fly, and the nymph dropper free-tumbling through the water in a natural presentation - then a deft flick of the wrist at the merest sign of hesitation from the dry, and fish on. Also of great interest was J.P’s news that 500 Grayling had been introduced to the stream at the start of the season. 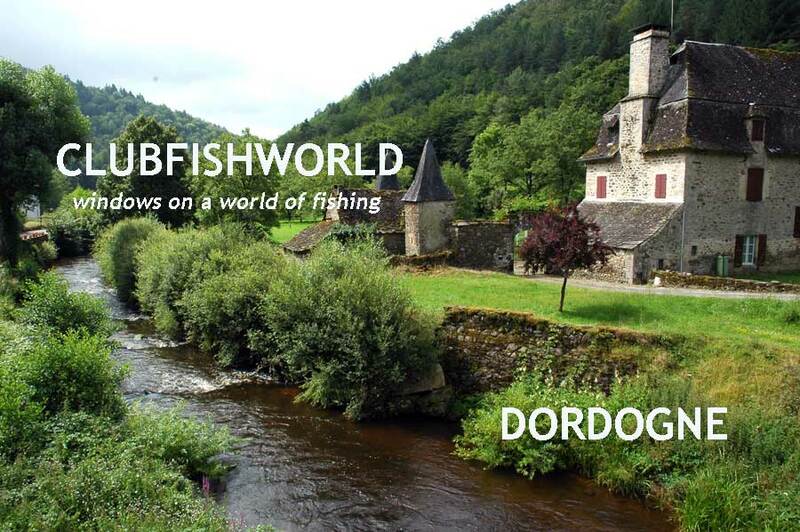 And given the success of their introduction to the Dordogne twenty years ago (it now holds the highest density of Grayling France) it’s fair to assume the Doustre has all the pre-requisites to mirror the Dordogne’s success. The afternoon produced something very different for me. We traveled upstream to a small mountain lake to fish for Black Bass on home made poppers (a Champagne cork cut it half with a crude feather and bits of rubbery legs attached) You take to the water by Indian canoe, cast amongst the lily pads – give the cork a good old yank to create a disturbance, wait a while, then repeat the process until you get an offer. I missed the first couple because I was unprepared for type of take. Given the huge size of a Bass’s mouth, I was expecting a cavernous opening to appear through the water to engulf the cork - not so! The water swirls (akin to the vortex above a large plug-hole) then the whole offering is sucked down through the surface in one gulp– give it a good beat, then strike - and boy, do they fight! It was terrific fun and we caught a few large (very greedy) perch into the bargain. The day was finished in grand style in a picturesque village which holds a weekly Farmers Market, with a difference. You choose from all manner of wonderful, fresh local produce (meats, cheeses wild mushrooms, vegetable, fruits, wines) then take your food to a large communal barbecue where it’s cooked for you free of charge. You eat at one of the many communal tables dotted around the village square - a wonderfully convivial way to enjoy a meal in the company of friendly locals and a perfect way to end a fishing day. By the time I arrived back at my charming riverside hotel, the Maronne’s barrage had been closed and the waters returned to a placid flow. Although virtually dark, I couldn’t resist the sight of a few dimpling rises on view from the bridge. When my first fly landed (unseen) on the water it was then full dark, yet incredibly, I was straight into a take and it felt like a really good fish. But immediately I started the retrieve I sensed something wrong – the fears realized when I beached my first ever Chauve-Souris (bald mouse) – a Bat! It had obviously swooped on the fly as it touched down on the water. And it was more than obvious I was destined for no luck on the Maronne when I awoke next morning to find the river in torrent again. But thankfully the barrage on the Dordogne had been closed overnight, although the river still needed time to settle. So that morning I indulged in a bit of tourism, visiting some of the numerous local beauty spots and marking a few likely looking watering holes for the evening’s meal. Then joined up with a friend of J.P’s, (Gregoire Ribot, another local guide) for a spot late afternoon fishing on the Dordogne above Argentat. Although the levels had dropped dramatically there was still a fair push of water that made wading very difficult (and dangerous) But Gregoire managed to winkle out a couple of small trout from a sheltered spot whilst I registered a disappointing blank. Then over a delicious dinner of local Duck cassoulet we laid plans for the following day, and it wasn’t just the food that was making my mouth water. The Dordogne at Beauliue is an immensely broad reaching piece of river with another set of barrages and several fish passes (they have an annual run of about three hundred Salmon which spawn in the upper tributaries) And here, conveniently, the river splits into three arms, with one of the two back streams having it’s own barrage which is generally closed to facilitate the fly angler; and this particular 1 Km stretch of no-kill water was one of those famed for its trophy sized trout and grayling! What a cracking piece of water: again, wonderfully peaty and clear, alive with insects and enfolded in a leafy canopy allowing intermittent rays of sunshine to illuminate its treasures. For me, one of the attributes of Grayling fishing is that you don’t have to stalk the water like a creeping ghost (I’m tall and clumsy footed) The Grayling invariably bunch together in the rougher, aerated water and seem far more forgiving of the anglers mistakes, unlike spooky Browns. We used Gregoire’s home made weighted nymphs, tied to allow the hook to float upside down to negate bottom snagging - these suspended under an indicator of plastic dough compressed to a small ball, and fished with the same short-line technique so ably demonstrated by Jean-Pierre. The fish took a while to come on: only one good sized trout to me and a good Grayling for Gregoire before we decided to stop for a riverside lunch. But the afternoon was a different story. We’d separately prospected our way up stream, Gregoire having touched and lost a couple before he eventually yelled out he’d struck gold! He was bringing to hand a beauty just as I joined up with him at three seams of converging water merging to one long rushing run, above what was obviously a treasure trove of a holding pool. Over the next hour and a half, five more beauties were hooked, photographed and returned to pool. Unfortunately, only one down to me: it seemed every time I returned to the water after photographing his fish, he caught another, and yet again I had to bank my rod in favour of the camera - anyway that’s my excuse, and I’m sticking to it. But I was more than thrilled with the quality of my solitary afternoon capture and consoled myself with thought of returning the following day. But how fragile the best laid fishing plans. Returning to the car, I found messages on my cell phone demanded an immediate return to my base in Normandy. With great reluctance I left early next morning, vowing to return at the earliest opportunity – sans camera!.